HinterWelt is proud to announce its latest Squirrel Attack! product, Squirrel Attack! the Dice Game. It is available at the HinterStore for $5.99 ($11.99 for the Family Pack which include 16 dice instead of the usual 4). Squirrel Attack! 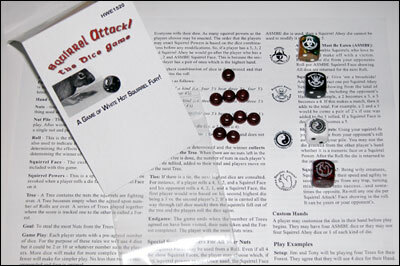 the Dice Game is an action packed game meant to be played between game sessions. Fast paced and easy to learn this game that features custom Chessex dice is also quick to pick up or teach to a friend. Customize your hand to reinforce your best strategies or just pick the dice up and play. Here is a look at what you get! When writing games, I need to do a lot of research. People often raise their eyebrows at that then question how much research do games based on squirrels need? A lot (how much to you know about squirrels? nuts? ), but really, it has more to do with how I view RPGs. To me, you (the GM and player) should have a game book that helps you take a short cut to playing. In essence, yes, I am writing a game but also a piece of condensed reference material. Sometimes though, as I am writing the game up I loose track of the game portion and just get into a spin cycle on the research part. Paralysis by Analysis is what they call it in IT. I end up forgetting that the reader most likely (I say “most likely” since some will) does not want a historical account of numerology in late third century Imperial Rome. The root of it comes down to (and I have been told many times I am quite good at this) making the game drip with adventure and character hooks and giving just enough or research to make it come alive. A tricky proposition to say the least but with great rewards if it succeeds. Jimbo – A messenger squirrel who worked at the labs developing the Rage Nuts. He was delivering a message when he ran into a messenger tube that was being sent to Security warning of the attack of the Animal Rights For Animals (ARFA). He lay in a coma for 28 days while Saline, another squirrel, took care of him. Saline – A lab test squirrel. To be precise, the control squirrel. She has been regularly injected with saline solution and is convinced that she has super powers because of it. However, she turns out to be the only one who is sane…well, mostly. Hannah Hugsalot – A genetically modified Koala Bear that has the ability to squeeze anything in half if she can get her stubby arms around it. She has a sunny personality that often gets her in trouble with zombies. Mr. Giggles – A hyper intelligent Chimp that was planning his break out when disaster struck…a zombipocalypse. It does nto matter how smart you are, you could never see that one coming. He knows most of the access codes tot he lab and if not can probably figure it out. He communicates through sign language and prefers to wear a white lab coat. He is working on his PhD. Pick-A- Chew – The product of a geneticist who played too many card and video games as a child, Pick is a violent mal-adjusted mutant hamster with a chip on his shoulder who always wants to “battle” anyone. Oddly enough, he wants to follow some sort of formal dueling format that only he seems to understand. He has the ability to channel electricity from existing sources and his mutations have left him with an odd yellow and red pattern in his fur that looks like a lightning bolt. Major Tom – a squirrel of the Old Guard, he knows the nature of the 28 Nuts and what the 29th Nut (should it ever come into being) would mean for the world. He knows he must save whoever he can and destroy the 29th nut before it can be consumed or the fate of the world will be sealed. So, those are the characters. I will write more a little later on. So, what do you think?